Here is how London Moves Quickly to tackle Muslim Tensions related to Terrorism! 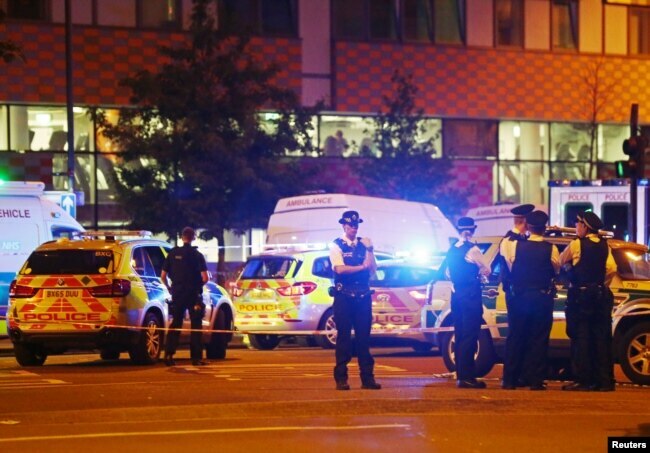 LONDON, June 20, 2017: The seconds after the rented van sped through bus lanes, jumped the sidewalk and plowed through a group of Muslim worshippers marked a crucial moment in Britain’s bid to come to terms with its rapidly growing Muslim minority. One person died in the incident, and at least 10 were injured. A video shot by a witness shows a chaotic scene in which scores of people angrily shove and push toward the suspect, some trying to beat him as he fought back. “We grabbed him,” said Abdikadir Warfa, who was a few meters away when the van slammed into people, pinning at least one victim underneath. Warfa said the suspect, now identified as 47-year-old Darren Osborne, was pulled from the van. “We tried to hold him down. He’s a very strong man. He hit people and was trying to escape,” Warfa told VOA. It was then that an imam came to the scene and, by many accounts, kept the crowd from seriously harming Osborne. 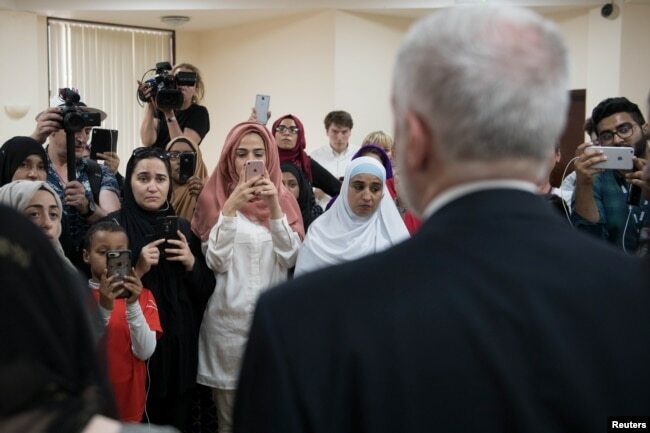 Warfa, like others at the scene, expressed relief that matters did not escalate, but he worries that continued attacks by Islamist extremists, and a potential rise in retaliatory strikes on British Muslims, could drive a wedge between Muslims and non-Muslims. “It looks like it will start a division, except if the government does something. The government needs to do something,” Warfa said. Within hours of the attack, British Prime Minister Theresa May declared the incident a potential act of terrorism and visited the scene, as did London Mayor Sadiq Khan, who appealed for calm and announced extra police officers would be deployed to secure mosques during the remainder of Ramadan. The scene of Muslim residents grabbing and beating the white suspect demonstrated how close Britain could come to an explosion of ethnic tensions, observers said. The anger on the streets surrounding the Finsbury Park Mosque were palpable in the afternoon hours of Monday, as warm temperatures hit an unusual 32 degrees Celsius. Some residents, including British born Muslims, described the frustration and unease they’ve experienced following the series of terrorist attacks. Farhia Ali, an IT student walking past the area cordoned off by police Monday, said she should not be held responsible for the actions of those who commit violence in the name of Islam. “I’ve been scared to be a Muslim walking the streets in a hijab for a very long time, but instances like this make me even more fearful of representing what (I) believe in, and that shouldn’t be the case for anybody or any community in the United Kingdom,” said Ali. The prime minister’s decision to declare the incident a potential act of terrorism, and assertions by police that Darren Osborne may face charges of committing, preparing or instigating an act of terrorism soothed Muslim community leaders, who have been voicing concerns about retaliation against innocent Muslims after the recent spate of deadly attacks claimed by the Islamic State group at Westminster, Manchester Arena, and London Bridge. “After the London Bridge attacks, the social media was [in] overdrive with hate against mosques,” said Shaukat Warraich, head of Faith Associates, a Muslim non-profit group in London that recently issued a report to mosques recommending enhanced security measures in the wake of Islamist attacks. Warraich told VOA that although Monday’s attack is the first of its kind and an isolated incident, he sees it as an indicator of rising tensions that need to be quelled between Britain’s Muslims and non-Muslims.